The somatosensory system comprises of ‘senses’ known as sensory modalities, these include; tactition (touch), temperature, proprioception (body position awareness) and nociception (pain). It is possible there are others, and these categories may be broken down further, for example kinaesthesia is the awareness of muscle strain/tension which is a form of nociception/proprioception. Sensory receptors and sensory (afferent) neurones of the somatosensory system can be found from the periphery (such as the skin, muscles and organs) through to the deeper neurones of the central nervous system. 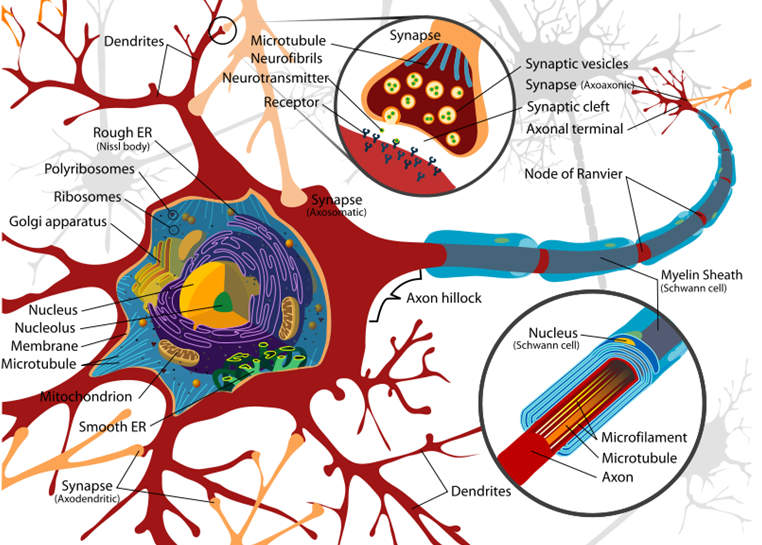 Specific receptors are able to detect different stimuli; the stimulation of a receptor causes information to be sent along neurones to the corresponding area of the brain. A typical somatosensory pathway will begin with a sensory receptor (for example a mechanoreceptor which is able to detect stress/stretch in the skin – helping to form the tactile sensory modality). 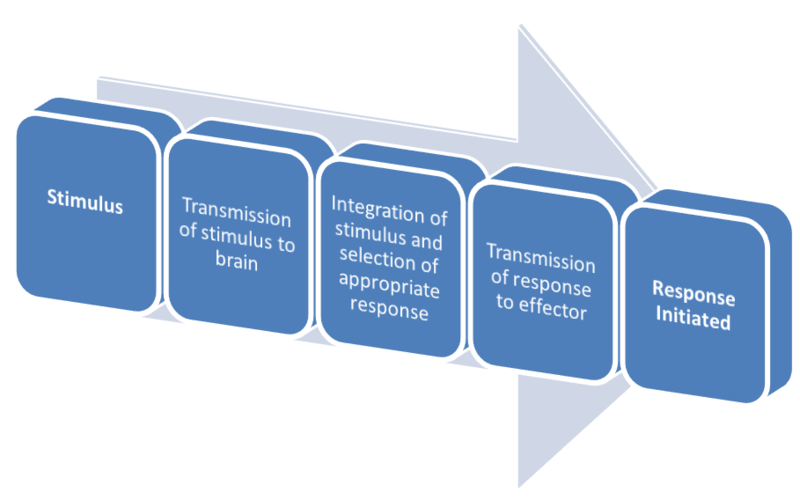 The stimulation of the receptor will cause information to be sent to the brain, where it will be perceived (in this example as touch). The information is sent to the brain through the spinal cord, typically three long neurones will facilitate this. The cell body of the first neurone is located in the dorsal root ganglion of the corresponding spinal nerve. The second neuronal cell body is located in the midbrain for motor/touch sensory modalities and the spinal cord for pain sensory modalities. Neurones involved in pain sensory modalities travel to the thalamus, up the spinal cord via the spinothalamic tract. 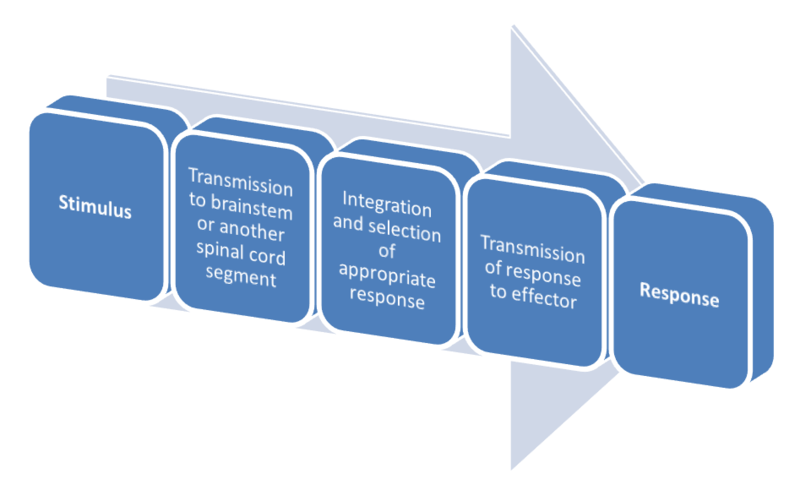 It is at this point that the ascending neurones cross-over (decussate) to the opposite side of either the spinal cord or midbrain (depending on the sensory modality – above), typically upon entry of the structure of decussation. The axons of these neurones mainly terminate in the thalamus, but may also terminate in the reticular system or cerebellum of the brain. In the case of touch and pain, the third neurone has its cell body located in the ventral posterior nucleus of the thalamus. The axon of this final neurone terminates in the postcentral gyrus (sometimes referred to as the somatosensory cortex) of the parietal lobe – where sensory information from different modalities is integrated. 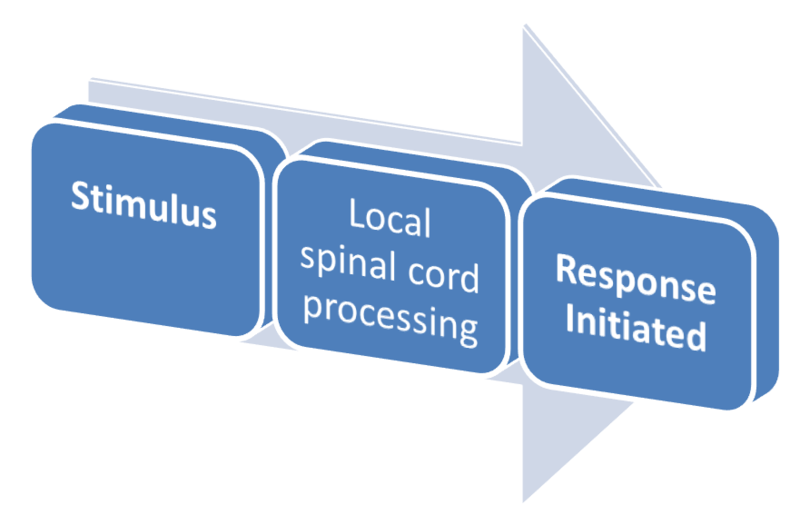 Information from sensory modalities is transmitted to the brain, via the spinal cord. These ascending neurones are able to take multiple pathways to reach their destination. These pathways can be split into three main routes. This pathway carries tactile and proprioception sensory modality information. Touch discrimination is owed to this pathway. The neurones terminate at the thalamus; they travel there along the medial lemniscus. 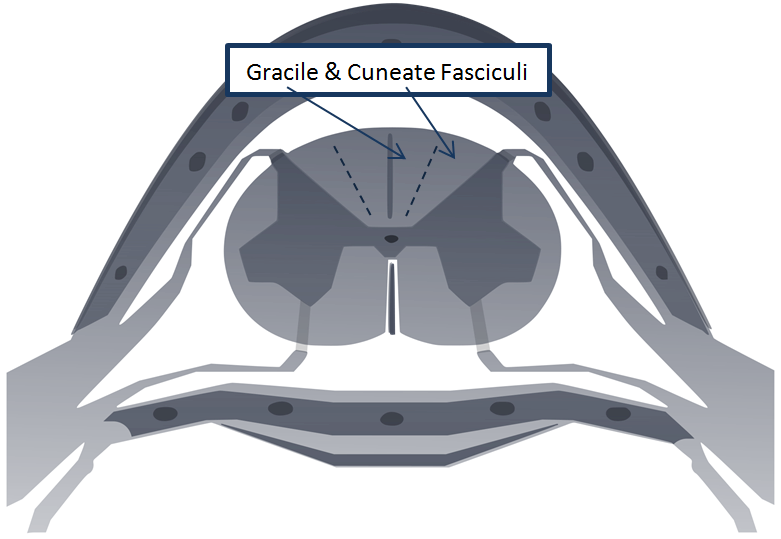 The role of the medial lemniscus is simply to carry the neurones from the Gracile & Cuneate fasciculi of the medulla to the thalamus. The ventrolateral pathway carries all sensory modalities (except proprioception) but is specifically involved in the propagation of pain. This pathway can be divided into two, as there are two possible tracts which the sensory modalities can take. These are the spinothalamic tract and the spinoreticular tract. This pathway is associated with muscle and joint proprioceptors primarily, involving it in postural reflexes. Many neurones which travel via this pathway do not decussate, as is common in the other pathways. After entering the spinal cord from an appropriate proprioceptor (or kinaesthesia receptor etc. ), the neurones synapse in the dorsal horn and then head straight to the cerebellum. The spinal cord can be divided into sections by which part of the body it serves; cervical (head/ immediate upper body & arms), thoracic (trunk), lumbar (lower back/legs) and sacral (hind). Each of these sections is then made up of 5-12 nerve pairs each serving a smaller sub section of the body/skin; they send sensory information to the brain from their corresponding section. This is significant diagnostically, because the deratomes (small section of skin served by a spinal nerve pair) are served by a specific spinal nerve pair. This means pain deriving from a deratome (or area of skin) if located, can be tracked back to its spinal nerve source. For example, a human with pain in the skin of the abdomen (Thoracic nerve 12 [Th12]) could point out this pain to a doctor. The pain would be a symptom of possible damage to Th12 and further action could be taken. Certain sensory modalities such as nociception provide information which needs to be responded to rapidly, using the example of nociception the information received may be that a hot object is causing tissue damage and requires the removal/release of the object quickly. This type of action is usually processed without involvement of the conscious brain and is known as a reflex. An example of this type of reflex is the ‘Tonic-Neck’ reflex; the reorientation of the head (and thus neck) causes a reflex repositioning of the body and limbs to accommodate the new posture. So we have discussed the transmission of somatosensory signals, but what about their detection? As said earlier, receptors found all over the periphery of the body (e.g. skin, muscle, and organs) detect specific stimuli and transmit the information to the brain, but there are multiple types of receptors available to detect the different stimuli. Two key attributes of a mechanoreceptor are the size of its receptive field and the speed at which its fibres adapt. The receptive field is important for discriminating from where a stimulus arises. A small receptive field has better discrimination than a larger one. Typically smooth skin has a small receptive field. The speed at which fibres adapts concerns how quickly the receptors become desensitised to a stimulus. Rapidly adapting fibres will quickly become desensitised and stop generating action potentials to a stimulus (they may fire action potentials when the stimulus is stopped), whereas slow adapting fibres generally continue to fire action potentials during the length of exposure to the stimulus. Found in smooth skin, these mechanoreceptors have a small receptive field and rapidly adapting fibres. They are said to perceive fluttering stimuli. Found deep within all types of skin, these mechanoreceptors have a large receptive field and rapidly adapting fibres. They are able to perceive vibrations. Found in all types of skin, fairly shallow. These mechanoreceptors have small receptive fields and slow adapting fibres. They are able to perceive pressure. Found deep within all types of skin, these mechanoreceptors have large receptive fields and slow adapting fibres. They are able to perceive stretching. The majority of somatosensory receptors are modified ion channels, which when stimulated allow the influx of ions and depolarisation which results in the generation of an action potential and its transduction. Mechanoreceptors like those listed above; require some sort of mechanical stress e.g. stretching, to stimulate them. This causes the shape of the receptor to distort and opens the ion channel. Chemoreceptors and thermoreceptors are stimulated by their corresponding stimulus, either directly or by the binding of the (chemical) stimulus to the receptor or a protein linked to the receptor. Again, stimulation leads to depolarisation and action potential generation. Pain is the perception of nociception, until ‘pain’ reaches the cortex it is not pain, but nociception. It is believed that there is a ‘pain gate’ in the dorsal horn, the theory is that by preventing a ‘pain’ stimulus from passing through this gate you can prevent its perception as pain – making it a target for drugs. The triple response is a phenomenon which occurs after inflammation, it results in pain – caused by irritant chemicals released after physical injury/damage. The chemicals are released onto the skin and free nerve endings. This causes nociception information to be sent to the spinal cord for processing, but the chemicals are also able to spread to other local nerves causing the release of more chemicals and more nociception transduction to the spinal cord. The overall effect is the spreading of inflammation and pain to a larger area than was originally damaged. Upon reaching the brain, the majority of somatosensory information travels through the thalamus and continues further into the brain. From the thalamus, information head to the sensory cortex. Processing here allows the sensory modalities to be perceived.